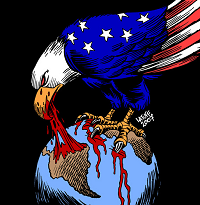 American Imperialism as a concept is fairly new, though its foundation is certainly not since it goes all the way from 19th century. If you want to write an essay about American Imperialism, there is plenty of useful information below. This idea works because of the belief that America is a truly exceptional country. The notion that America is in some way better than other countries in historical, cultural, religious, institutional, or political terms solidifies extending American control and influence over other nations. In the past, it was common for politicians to discuss the uniqueness of America, though many other official persons in the public eye also made the same statements. This helped to increase public consciousness of an idea that in truth had no merit. America's cultural roots and identity have been powerful factors in determining foreign influence since the 18th century. As a country, it was the land of discovery before it became fully inhabited. Discovery and expansion served as powerful ideas that were ever present in the minds of the American citizens. This is how it was back in 1890. Modern American Imperialism is a far harder topic to define because the world is very complicated. It can be defined as the result of many things like American liberalism, social democracy, and Marxism. In many cases, it can be seen as negative or exploitative. A clear example of this could be the many financial and military exploits occurring under the veil of US influence. Many people argue that the Iraq War was fought not to remove a regime but to simply enforce American Imperialism and national ideals while exploiting the region's natural resources. Both of these factors can be defined as negative and exploitative. After all, no country can use the idea that it is exceptional to justify occupation. Likewise, no country should be able to use military actions as a ruse for ulterior motives. Many people argue that American Imperialism will disappear in the future. If it does, the concepts of national elitism will hopefully disappear as well.